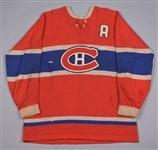 Lot Detail - Doug Harvey's 1957-58 Montreal Canadiens Game-Worn Alternate Captain's Wool Jersey with LOA - Team Repairs! - James Norris Trophy Season! - Photo-Matched! Doug Harvey's 1957-58 Montreal Canadiens Game-Worn Alternate Captain's Wool Jersey with LOA - Team Repairs! - James Norris Trophy Season! - Photo-Matched! Enlisted to serve as player-coach during his inaugural season in The Big Apple and bring his years of experience to a then-lowly New York Rangers squad, Doug Harvey would first see plenty of hometown action in the Q throughout his late teens and early-20s. His first 35 NHL games would occur in 1947-48, with the season split between Montreal and the AHL’s Buffalo Bisons, with Harvey seeing action as a starter on the Habs blueline beginning in 1948. Over a dozen seasons would follow, with the 7-time James Norris winner the premier defenceman of the Original Six era, completely dominating the 1950s with appearances at each and every All-Star contest starting in 1951, all while anchoring the defence core throughout the Bleu Blanc Rouge’s epic late-1950s Stanley Cup Dynasty. Additional years in the AHL would follow his post-NHL days, with a pair of comeback seasons in his early-40s with the Blues, reuniting with longtime Montreal teammate Jacques Plante in 1968-69. Widely regarded as one of the greatest defenceman in history, his number #2 sweater was retired by the Habs in 1985, never to be worn again. With the hockey cognoscenti in complete agreement, Harvey would receive unanimous voting at his Hall of Fame enshrinement, in 1973. 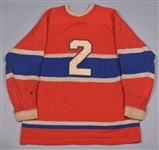 Ranked number 6 on The Hockey News' list of the Top 100 NHL Players of All Time, we are thrilled to offer to our loyal bidders an utterly desirable Montreal Canadiens alternate captain’s wool sweater that saw action on the back of paramount defenceman Doug Harvey during the Stanley Cup-championship season of 1957-58, and amazingly, it’s been photo-matched! A partially-detached "L.J. Parent & Fils Ltee - Montreal" label is present along the collar, with the vintage sweater measuring-out across the upper reverse to roughly a modern size 48. Featuring hockey's most famous and recognizable team crest fully administered in layered red, white and blue felt, the white-over-blue felt alternate’s “A” sits just above the left breast, with a shorter-style “2” over verso in matching material, affixed through zig-zag pattern attachment. 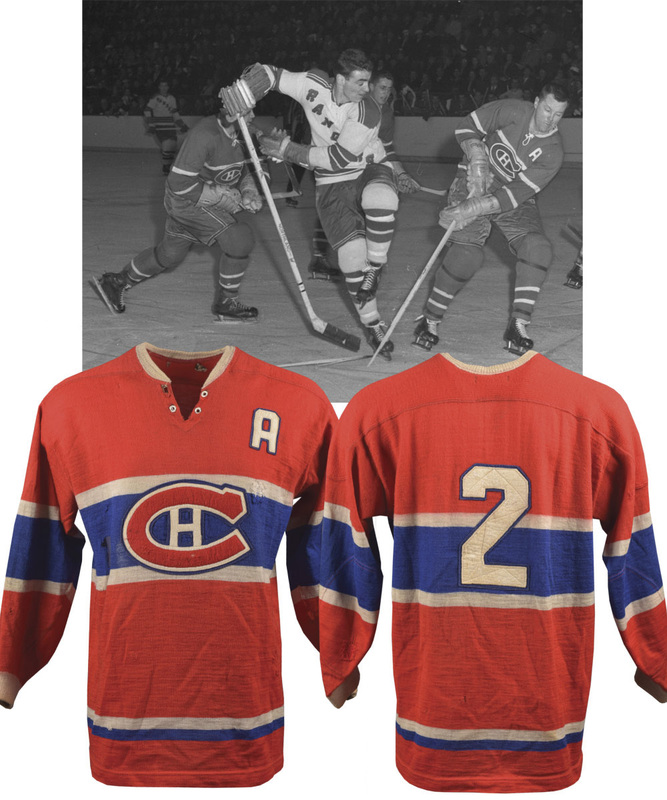 The sleeves are void of any numbering, as this feature wasn’t utilized by the Habs until the following season, with the familiar blue and white striping patterns seen over the sleeves, chest and lower band, along with four-eyelet configuration on tie-neck construction. The vintage wool material remains soft and supple, with the colouration especially solid, with the red body and blue striping accents all retaining their brightness and vibrancy. Lacking any obtrusive dark marks or unsightly game wear, a large hole is visible to the right of the team crest, with a few smaller examples over each sleeve and the lower reverse. 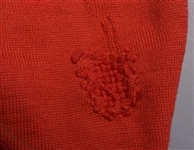 A number of team repairs both great and small serve as witness to the garment’s thorough use, with large examples near the team crest and over the left elbow, along with smaller repairs situated over the lower front and sleeves. There is also some wear to the team crest, with a small area of material loss centered over the lower portion as well as some sweat staining around the collar and armpits, with a single grommet missing over the collar. Getty Image #51428036 has been matched to the placement and particularities of the team crest and the alternate captain's "A", while an included numeric image from Feb 22nd 1958 has been matched to both the big team repair at the top left of the team crest, and to the perfect placement of the team crest and alternate captain's "A". Additionally, a second numeric image, this one from March 7th 1958, is showing the white thread-repair area on the right side lower hem in the white striping band, but the image is not high resolution enough to call a definitive photo-match. We should also note that a dozen other numeric images of Harvey from the 1957-58 season that show the correct placement of both the team crest and reverse number are included. Practically invented for Harvey, the Montrealer would be selected seven of the first nine times the James Norris Trophy was awarded, with only Bobby Orr earning the prestigious acknowledgment more times. Worn by one of the game’s all-time greats during the very pinnacle of the world’s most famous and celebrated hockey team, this ultimately important wool is deserving of iconic hobby status, with permanent placement within the pantheon of legendary sporting jerseys assured. A Classic Auctions LOA will accompany, and please take note that this item may be subject to a silent reserve.